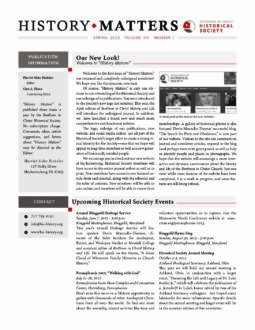 Welcome to the first issue of “History Matters,” our renamed and completely redesigned newsletter! We hope you like this dynamic new look. Of course, “History Matters” is only one element in our rebranding of the Historical Society and our redesign of its publications. You were introduced to the Society’s new logo last summer. This year, the April edition of Brethren in Christ History and Life will introduce the redesigned journal. In addition, we have launched a brand new and much more comprehensive and functional website. The logo, redesign of our publications, new website, and social media outlets are all part of the Historical Society’s larger effort to create a strong visual identity for the Society—one that we hope will appeal to long-time members as well as a new generation of historically minded people. We encourage you to check out our new website. Historical Society members now have access to the entire journal online as well as in print. Non-members have access to one featured article from each journal, along with the editorial and the table of contents. New members will be able to join online, and members will be able to renew their memberships. A gallery of historical photos is also featured. Devin Manzullo-Thomas’ successful blog, “The Search for Piety and Obedience,” is now part of our website. Visitors to the site can comment on journal and newsletter articles, respond to the blog (and perhaps even write guest posts), and perhaps even help us identify people and places in photographs. We hope that the website will encourage a more interactive and dynamic conversation about the history and life of the Brethren in Christ Church. Just one note: while most features of the website have been completed, it is a work in progress, and some features are still being refined. Rhoda E. Lee, Brethren in Christ hero who gave an impassioned plea in 1895 for the denomination to start a foreign mission program. In 1978, a play about the history of the Brethren in Christ Church was presented at the General Conference, held in Grantham, Pennsylvania. It was called “Pilgrimage,” and was written and produced by Norman A. Bert. Several times during this play, the question was asked, “Who is Rhoda Lee?” Yes, she was the lady who got up at conference in 1895 and made a plea for foreign missions. But who was she? Where had I heard this name before? Ah, yes, I remembered. She was mentioned in one of my great-aunt Hettie Fernbaugh’s letters from Africa to her sister, my grandmother Josie Haynes in Abilene, Kansas. Hettie had come from her home in Indiana to be near her sister and she joined her sister’s church, the Brethren in Christ. She had felt a call to foreign mission work but the Brethren in Christ had not yet sent missionaries overseas, so she went under the World’s Gospel Union to Morocco in 1894. Rhoda’s short obituary in the Evangelical Visitor said she was interred in the Abilene cemetery, so my search began there. I had now been living in Pennsylvania for some time, and each year when I went home to Kansas to visit my parents (David and Ethel Wenger), I would go to the cemetery in Abilene to see my grandparents’ graves. I always looked for a stone with Rhoda’s name, but found none. On one visit, I was surprised to find a stone with the names of James and Rhoda Lee. I went immediately to the little office in the cemetery and asked the caretaker if he knew who placed the headstones there. He said he did not have that information but asked which stone I was interested in. When I told him, he said, “Well, I do know about that one,” and proceeded to tell me that the stone had originally been rejected because the name of the deceased had been misspelled. It was bought recently by Rhoda’s granddaughter, and after being inscribed on the opposite side with the names of Rhoda and her husband James, was placed face down in the earth. The caretaker gave me the name of the granddaughter, Dorothy Carr, and her address in Chapman, Kansas, where she lived with her husband. I called her and then my mother and I drove to their home to visit her. Dorothy was the daughter of Harry Lee, Rhoda’s youngest child, who was only eleven years old when his mother died. Harry had been shifted around a lot after his mother died and Dorothy knew very little about her grandmother. I gave her more information than she gave me, but she did give me the only known picture of Rhoda. 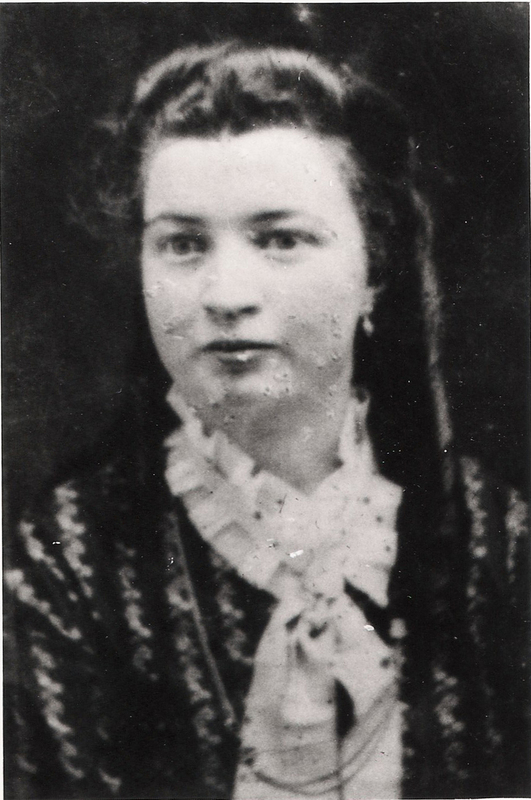 It was probably taken near the time she and her birth family moved from Iowa to Kansas. Helen Johns has written a carefully researched book, Searching for Rhoda Lee (Evangel Publishing House, 1998; still available on amazon.com), but I thought that this information about why and how this search came about would be of interest to Historical Society members. Wilma I. Musser lives at Messiah Lifeways, Mechanicsburg, Pa., and attends the Messiah Village Chapel Brethren in Christ Church. Don’t miss this once-in-a-lifetime opportunity to gather with thousands of other Anabaptist Christians from all over the world. Find out more about the daily schedule of programs and activities; tours before, during and after the assembly (including ones to Brethren in Christ locations like Messiah Lifeways, Messiah College, and Ringgold Meetinghouse); volunteer and hosting opportunities; and how to register for the assembly. 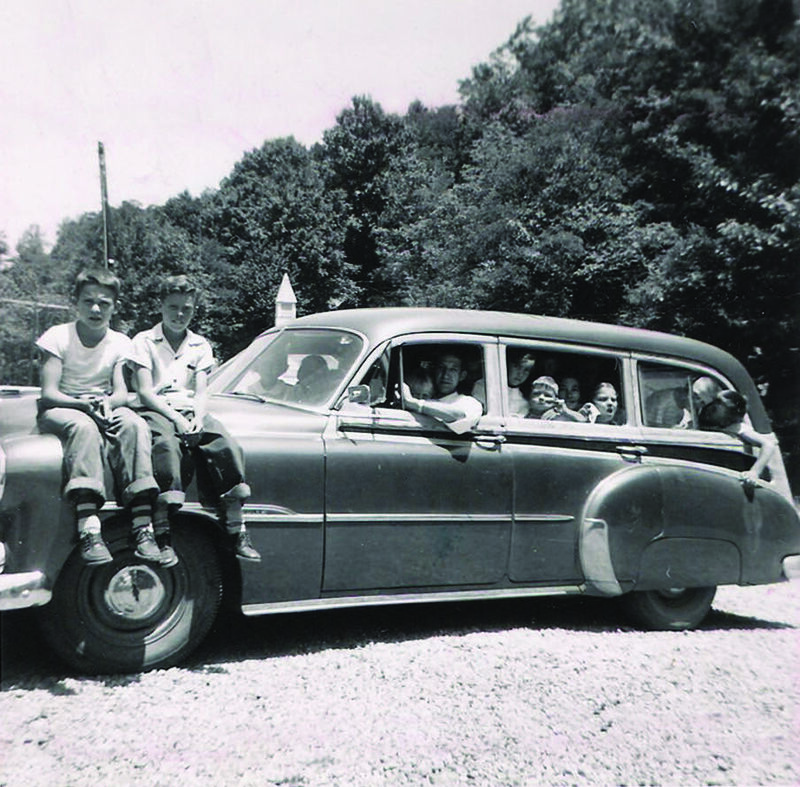 The Historical Society has been a co-sponsor of “Journey to PA 2015,” a series of events in central Pennsylvania highlighting the global church in anticipation of the assembly. This year we will hold our annual meeting in Ashland, Oh. in conjunction with a larger event, “Honoring the Life and Legacy of Dr. Luke Keefer, Jr.” The event will celebrate the publication of a festschrift in honor of Luke, edited by Dr. J. Robert Douglass and Dr. Wyndy Corbin Reuschling, both of whom were colleagues of Luke’s at Ashland Theological Seminary. The festschrift, entitled Celebrations and Convictions: Honoring the Life and Legacy of Dr. Luke Keefer, Jr., is being published by the Historical Society later this year. It contains a brief biography of Luke and essays on topics related to Luke’s particular interests. Some essays are written by Luke’s colleagues at Ashland, while others are by Brethren in Christ authors. The keynote speaker for the two-day event is Shane Claibourne, founder of Simple Way in Philadelphia and well-known speaker and author of such books as Jesus for President and The Irresistible Revolution. Shane will speak Friday evening, October 1, on “Resurrecting Church,” and again on Saturday morning, October 2, on “Tearing Down Walls.” On Saturday afternoon, there will be a variety of workshops sponsored by the hosting organizations—including Ashland Theological Seminary, the Brethren in Christ Historical Society; the Sider Institute for Anabaptist, Pietist, and Wesleyan Studies at Messiah College; the Ashland Center for Nonviolence; the Department of Religious Life at Ashland University; and Ashland Brethren in Christ Church. The event is free, but registration is required. More specific information about the annual meeting will be in the summer edition of this newsletter. Until recently, you would have needed to come to the Archives in Grantham, Pa. to find the complete set of the Evangelical Visitor (to read about the response to 911 or to find the obituary of Aunt Elizabeth), the full set of the Handbook of Missions (to read about God’s Love Mission in Detroit), and the diaries of H. Frances Davidson. But now you can search these documents and others on the Archives’ website. 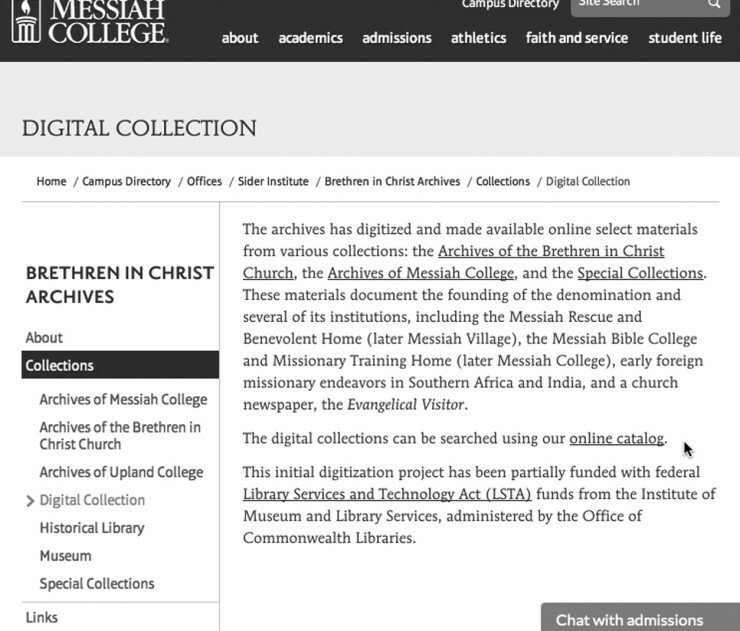 There you will find links to the entire collection of the Evangelical Visitor (published from 1887 through 2004), the Handbook of Missions (1918-1978), and transcripts of H. Frances Davidson’s diaries (1881-1931), all available as digital downloads from the Archives’ online collection. The initial digitization project was partially funded with federal Library Services and Technology Act (LSTA) funds from the Institute of Museum and Library Services, administered by Pennsylvania’s Office of Commonwealth Libraries. Since the conclusion of the grant-funded phase, the Archives staff has continued to digitize various publications and other documents. Some of them, such as the complete set of ­Amazwi Amahle (Good Words), published by the Brethren in Christ Church in Zimbabwe from 1957-2007, should be available by June. Later this year the Archives plans to create a “Virtual Exhibit” online, which will introduce website guests to the various items that can be found in digital format. But until then, you can search our online collection for the Visitor, the Handbook of Missions, and the typed transcripts of Frances Davidson’s diaries by using these step-by-step instructions below. And while in the Online Catalog, feel free to browse the random images, or put in a key word like “Africa” or “India” and see what you discover. 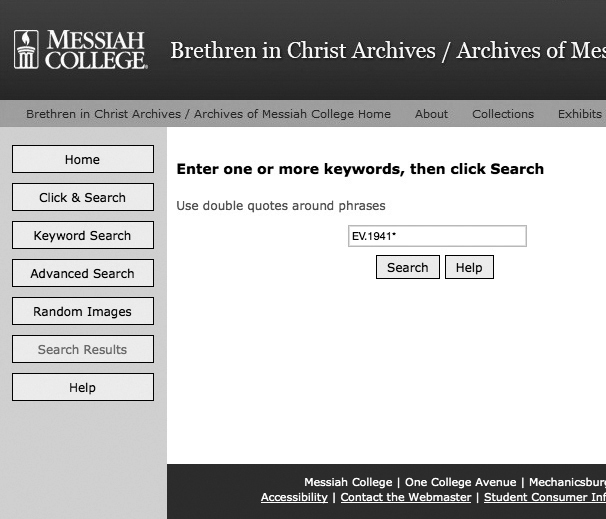 For example, if you type in the phrase “Messiah Bible College” (be sure to include the quotation marks) in the Key Word Search tab, you will find sixty-two records, including the founding documents of Messiah College, early college catalogs, etc. Click on Digital Collection on the “Brethren in Christ Archives” sidebar. On the resulting webpage, click on the Online Catalog link, which appears in the short second paragraph (see Illustration 1). This takes you to the PastPerfect Online initial search page, where you have several search options listed on the sidebar (see Illustration 2). 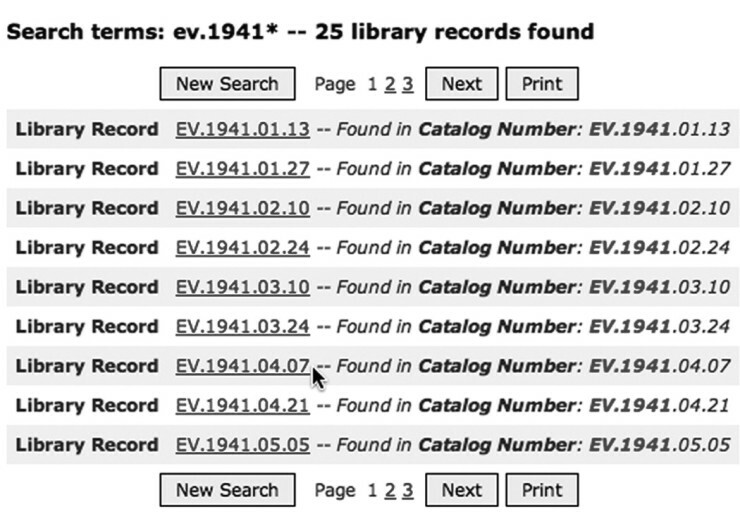 The “results” page(s) gives a list of records in which the search term is found (Illustration 3). Click on the link you want to follow (in Illustration 3, the cursor is at the link for the issue published on April 7), and that record will be shown on the screen, with selected information about the record in the right-hand panel (see Illustration 4). For most documents, there will be no preview or thumbnail image. For photographs, a low-resolution image will appear. Scroll down to the bottom of the page and click on the Click Here link to download a PDF document that can be printed and is searchable (if it is not a hand-written document). Periodicals have an “Object ID” number that reflects both the name of the publication and the date. 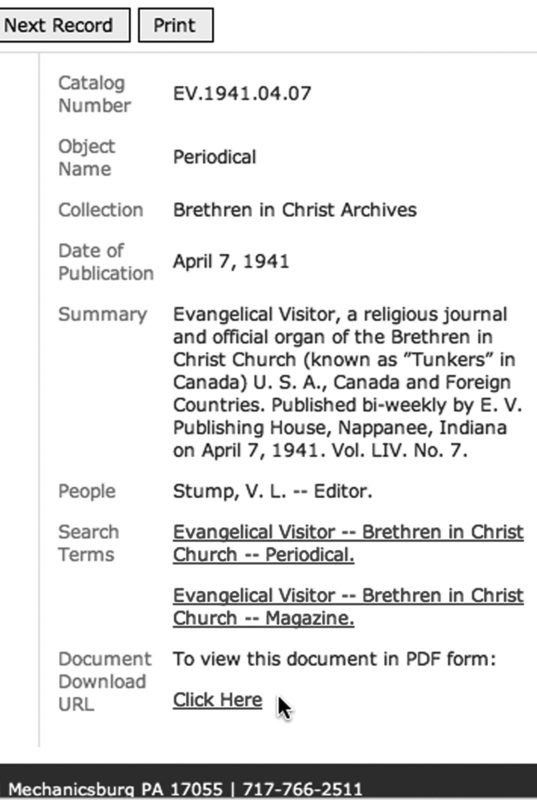 For example, the Evangelical Visitor issue of Dec. 22, 1941 has this object ID: EV.1941.12.22 which you would enter in the “Search” field (step 4 above). If you wanted to browse through all the 1941 issues, you would simply enter EV.1941* (the asterisk is critical) and you would see a list of the 25 issues published that year (see Illustration 3). The object ID for the 1956 Handbook of Missions has this object ID: Mission HB.1956. The transcript of Frances Davidson’s first diary has this object ID: HFD Diary Vol 1 and the searchable document that can be downloaded as a PDF file starts with that same ID number.